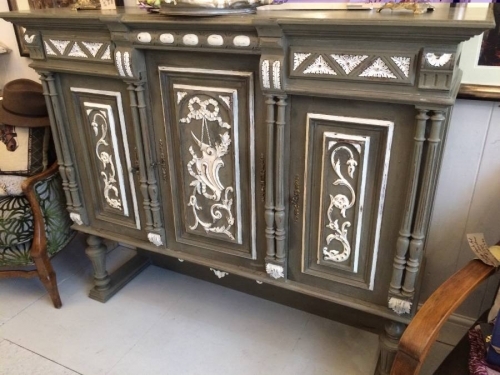 This is the upper part of an antique French sideboard buffet unit in Henri II style with superb carvings throughout with turned columns each side and one internal shelf. It has been restyled to fit in to today's lifestyle homes. It has been painted in Grand Illusions 'maroc' with 'sel de mer' highlighted detailing and 'vanille' internal finish with a clear wax finish. Woodworm treated as a matter of course.